We're pretty sure that the BioWare guys are just having some fun regarding Kinect-powered features in Mass Effect 3. At least, we hope they are. 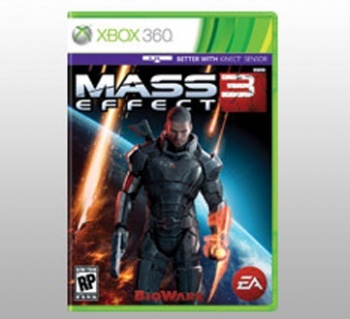 Several days ago, sharp-eyed viewers saw temporary Mass Effect 3 box art on the EA store that carried with it the purple "Better With Kinect" bar for games that use Microsoft's magic little camera. Said art has, of course, since been removed (but you can see it here to the right). While neither BioWare nor EA have officially commented on the Kinect slip, Mass Effect 3 executive producer Casey Hudson wasn't above commenting via Twitter: "Can't comment on the Kinect rumors. On an unrelated note, I just flew to the Citadel and boy are my arms tired." The game's producer Michael Gamble fired back: "[Planet] mining is a pretty good workout too..."
We can't know just why the placeholder ME3 box had the Kinect bar on it, but this is almost certainly just Gamble and Hudson having fun with their fans based on a silly rumor. It seems unlikely that BioWare would include Kinect functionality, given that ME3 is going to be a multiplatform game. If there were any Kinect features, they would have to be completely ancillary. While I support motion gaming as a general concept and think Kinect is a neat concept that has proven very hard to actually work into a game, I just don't think it would fit with the Mass Effect setting. So, let's just hope that Gamble and Hudson are just pulling our collective legs.